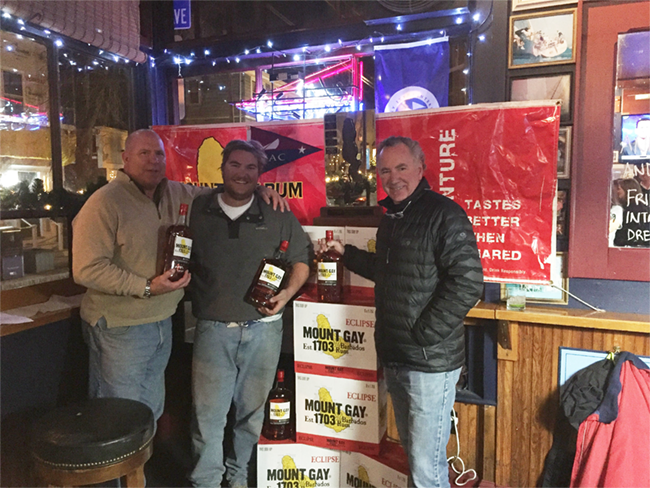 December 12, 2016 – Competitors who successfully completed and set new records for the Mount Gay Rum Around Jamestown Record were recognized at a prize giving party hosted by the IYAC in Newport, RI this past Friday, December 9th. During the span of the five month long competition, 4 attempts were made at ousting the standing record, and Zach Marks of St. Petersburg, Florida, was able to come away victorious, beating the standing outright record set in 2015 by Phaedo3. On Friday, October 28, 2016, Zach Marks rounded Jamestown on his foiling kiteboard with an elapsed time of 53 minutes and 37 seconds. This time bested the previous record of 00:56:33, held by Lloyd Thornburg’s Mod70 Phaedo3, by 2 minutes and 56 seconds. Marks was awarded his weight of 175lbs in Mount Gay Rum, which is equal to 4.5 cases, for setting the outright record. Marks was unfortunately unable to attend the event due to a prior coaching commitment and, in his absence, the award was accepted on his behalf by, Ben Wilkinson. High res images can be found HERE. Dave Lussier, who attempted on Bazinga!, an F31, and Matt Reinhardt, who attempted on his foiling kiteboard Delta Hydrofoil, were recognized for attempting the record this year. Both competitors were not able to complete the rounding due to weather circumstances. Skipper Jeremy Wilmot of the M32 Black Boat was recognized for setting the 2016 Multihull 32’ & Above Division with a time of 01:08:42. Black Boat team members Sam Loughborough and Martha Fortin were present to accept their award, two handles of Mount Gay Rum. High res images can be found HERE. The Around Jamestown Record presented by Mount Gay Rum in association with IYAC is a perpetual all out record for sailing around Conanicut Island (also known as Jamestown) in lower Narragansett Bay, Rhode Island. Similar to other outright speed records, contenders decide when to make their record attempt and also which direction they will sail around Jamestown. This means contenders choose the most advantageous weather conditions and tidal flow in which to attempt the record. The 2016 record was open from Memorial Day until Halloween, October 31st during the hours of daylight. Five categories are recognized for annual divisional honors with the overall perpetual trophy going to the boat with the outright fastest time.